Below is a cursory (for the time being) index of available dedicated macro lenses. As a Nikon shooter I have naturally made myself much more familiar with lenses either manufactured by Nikon or third-party that have been made in NAI mounts. Obviously, excellent lenses do exist outside the Nikon system (though I would contest Nikon definitely has some of the greats). Due to my financial status however, I haven't been able to explore other systems nearly as in depth as I would like to. I will say this list includes just about all of the best macro lenses any third party company has had to offer which does concern users of a number of different systems since you can typically find these lenses in any one of the more popular camera mounts. Also, it is often easier to adapt Nikon lenses to other SLR systems based on the longer flange distance. Consequently, even if you are not a Nikon user, the Nikons may yet be of value to you! Essentially, I have begun this list from my knowledge of Nikon macros and related third-party lenses and will be expanding from there. I have included links to the lenses which I have personally reviewed here at this site. My goal, is aimed more at the obscure macro lenses, especially those from the manual focus eras. I also don't have the funding to get into all the new autofocus lenses...at least not just yet! 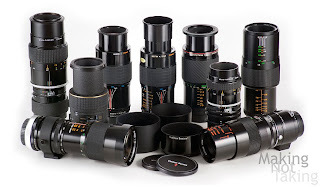 Many lenses have multiple versions released over the years. I do want to be sure to note this because I have run into this many times in looking at third party lenses especially. Often different models were manufactured by different companies. The quest to find this info however can be arduous. I have grouped lenses which I believe are the same optical design together, however if you have information that proves otherwise, by all means let me know! Also I have attempted to define some of the acronyms used by the various manufacturers to clear up some confusion between varying models. Often manufacturers tweak the design by adding a distance chip to allow for better matrix metering and thus constitutes a "new" model. However, to the average user, very little may change except finding info on the previous version becomes increasingly difficult because when searching the older lens, info the for "new" version floods the results. I have provided most of the nomenclature to understand what each of these macro lenses is equipped with per each brand as well as links for more info. Here is an extensive list with many brands included. * - Denotes lenses which may all be produced by the same manufacturer but are branded differently. Other possibilities include different manufacturers but the same optical formula. [mv] - Denotes Multiple Versions. In many instances, cosmetics of a lens may change but the optical formula remains the same. In some cases I just haven't gotten to denoting the variations yet. Below is a short list of a few of the more obscure macro lenses produced by Nikon. For a full list and write-ups see this website: http://homepage2.nifty.com/akiyanroom/redbook-e/index.html . These, when they do show up on the used market typically fetch extremely high prices. I have surely missed quite a few lenses but I will continue to update this page.